Author's note, 2017: You know what, I bet I'd like this movie more now. I also bet I'm never going to find out. Darren Aronofsky's third feature The Fountain is a complete mess, but it is at least an interesting mess. In this it is unlike Aronofsky's first feature, π, which is a cluttered and noisy mess (I have not, at this time, seen his second feature, Requiem for a Dream). I will not recount the plot of The Fountain, because I do not know what it is. 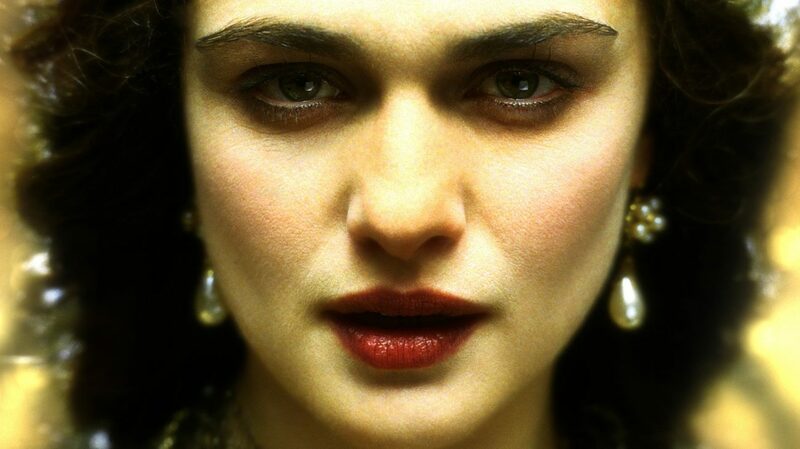 What I can say is this: the film opens with a story of a conquistador played by Hugh Jackman travelling to Central America to find the Mayan Tree of Life on the orders of Queen Isabella of Spain, played by Rachel Weisz. Then, the film transitions to a story of a research scientist named Tom, played by Jackman, hoping to find a miracle cure for his wife Izzi, played by Weisz, who is dying of a brain tumor. Then, the film transitions to a depiction that is not entirely narrative and therefore cannot be called a "story," of a bald man played by Jackman travelling through space in a large glass ball with a dying Tree of Life inside of it. These things all occur simultaneously over a span of 1,000 years. It's much easier to describe what the film is About, rather than what it's about, if you follow my meaning: it's an exploration of the relationship between love and time, suggesting that no matter how long we experience love before death takes it away from us, it's never long enough. This is a nice theme, but it is not well-served by The Fountain. In fact, it's fair to say that none of the things that we expect to find in narrative film are well-served by The Fountain: the plot is incoherent (apparently the conquistador is in a book Izzi is writing, but the bald man has memories of the conquistador's life, and of Tom's life, and it seems likely that the bald man is Tom in the future, but that doesn't explain how Tom seems to flash-forward, and...), the characters are nonsensical, and therefore poorly acted (Jackman tries his level best, but fails to do anything well except for look awed; Weisz seems to be here only to preserve conjugal accord with her director/lover), and there is no arc of any sort. But I called it "interesting," and interesting it is: this is a dazzling visual work. In fact, it's one of the most cinematic films of 2006, on the strict grounds of "film is a visual storytelling medium." Using visuals is just about the only way to get any sort of sense out of the film whatsover. I have not recently seen a film that relies so much on the repetition of visual motifs. Running down a laundry list of the film's imagery would be tedious, but I will point out one example from the trailer: in each sequence, there is a vehicle that moves towards a camera which is upside-down; as the vehicle approaches and drives underneath, the camera tracks it 180° to end up right-side-up watching the vehicle recede. That took far too long to describe, but it gets at the core of the film: extremely complicated and interesting visuals that are repeated, and gain thematic meaning in the repetition. The other major visual tool is the absence of light. This is a dark film, almost appallingly so, except for the very end when all three stories erupt in sunlight, of varying sorts. This is meant to reflect the emotional release of the three Hugh Jackmans, and the climax of the film's praise of love in the face of mortality. It does not, but only because it has not yet been made clear that emotions exist in the world of the film. I choose not to belabor this discussion, largely because writing about images is like dancing about architecture, and also because the visuals are the sole pleasure of the film, and I do not want to cheat anyone out of feeling that pleasure. Aronofsky was present at the screening I attended, and he made a statement that explains, I think, everything about why his films are the way they are. He is not interested in pleasing the critics, he said, his desire is to make films for those who are on his wavelength, not to mull over and think about what they have seen, but to be awed during the film for how "cool" everything looks. And certainly, in The Fountain there are many cool images (the above-mentioned vehicle motif) that don't give much to think about. It's not even that Aronofsky is merely throwing ideas at the wall to see what sticks; he is throwing things because they look so nice in flight, and he isn't even aware that the wall is there. To the many, many fanboys in attendance (many of whom went on to write fawning IMDb reviews), this is a sufficient thing, even admirable. I will hardly proclaim that I am a better person, or smarter, than these people, because for all that Aronofsky's films are empty of meaning, they are very smart, indeed. But I think it must be sad and callow to go through life only caring if things are "cool." And that said, The Fountain is extraordinarily cool. It is one of the coolest films I have seen this year. It's frustratingly cool, in fact, because it's entirely obvious that Aronofsky could be making unqualified masterpieces, with his sense of visual language. Instead, we are presented with a film whose meaning is entirely surface-level, and yet almost impossible to understand; a film with a sophisticated cinematic language married to a pre-dramatic story. I love it because it makes me angry that I can't love it more than I do. Categories: ciff, indies and pseudo-indies, love stories, science fiction, what the hell just happened?